Well, we planned to go camping the past two nights, but the weather conspired against us. Yesterday, we made a very long trek across Nova Scotia to the northernmost section: Cape Breton Island, full of small Celtic seaside communities. I have to admit that I did almost no planning for WVT; that was Harrison’s job. 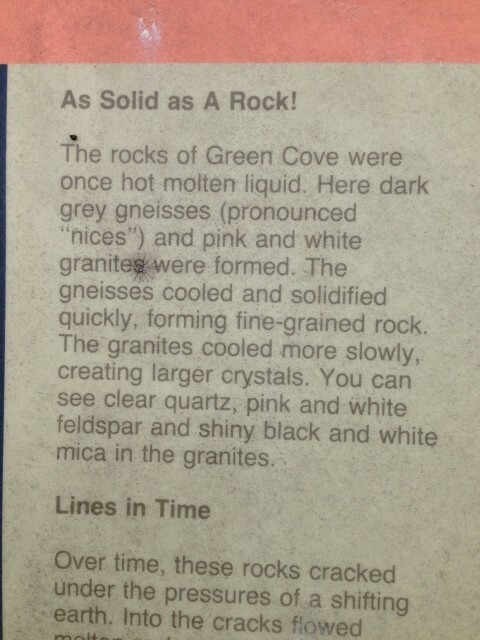 (I’m in charge of trip documentation.) As such, I had no idea where we were going in Canada, so everything has been a delightful surprise. 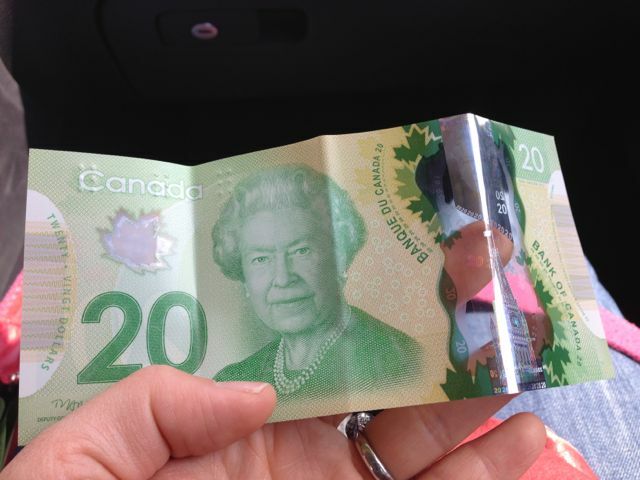 Like Canadian money having a transparent panel? Delightful! And the amazing views along the Cabot Trail? Delightful surprise! 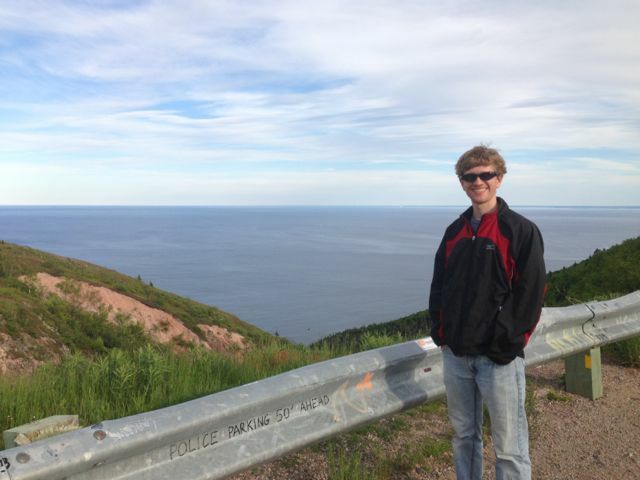 This scenic overlook on Cape Smokey? Delightfully surprising! 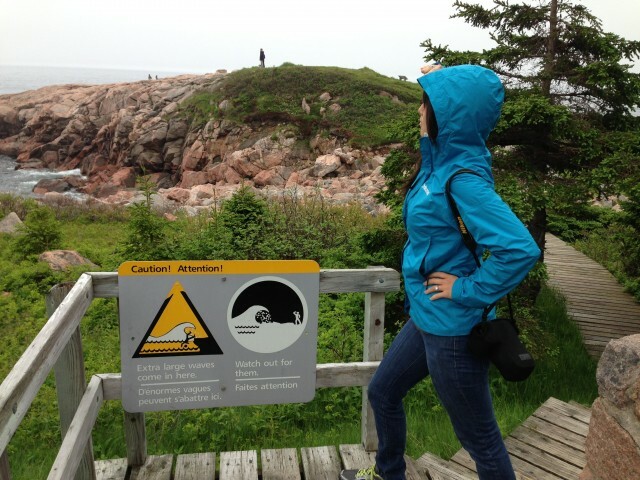 Once we arrived in Ingonish, we nixed the camping plan. Rain on the forecast and driving around with a very wet tent did not sound wedding victorious, so we opted for a “motel” in Ingonish. Along the Cabot Trail, there are no big hotels. All the accommodations are either small cabins/cottages for rent or “motels”–basically, long-ish trailers with small, no-frills rooms. And this was the view from the Sea Gull restaurant where we ate dinner last night. 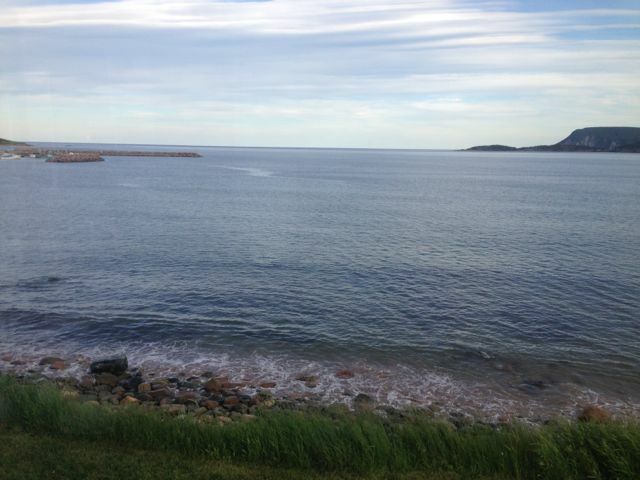 Unlike most waterfront dining and lodging, the businesses in Cape Breton are cheap and small. 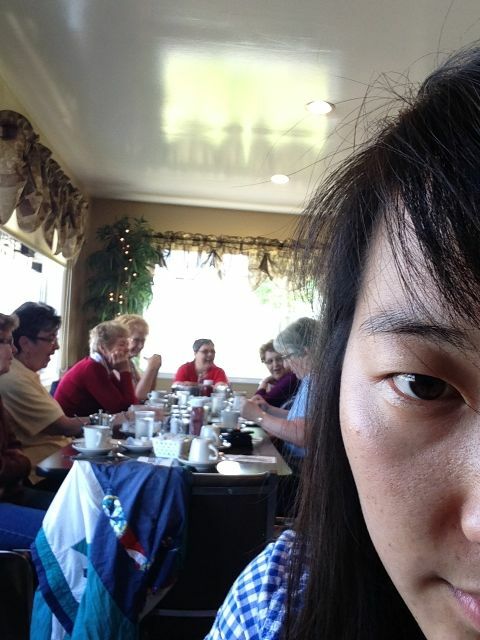 Last night, we ate at a plastic picnic table, overlooking the Gulf of St. Lawrence, on a screened-in porch that threatened to slide into the water. It was tasty and thrilling. 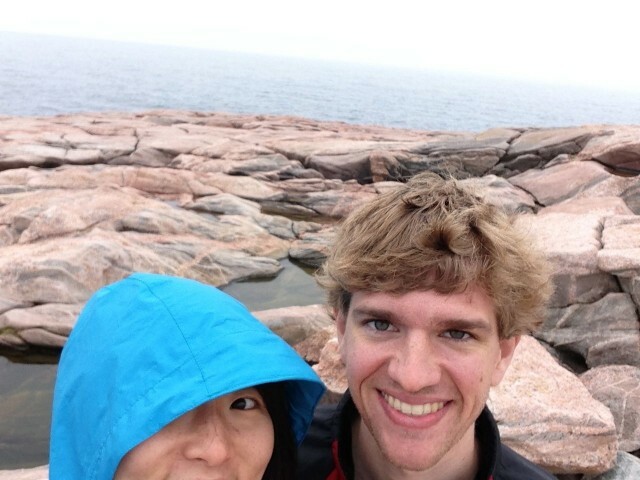 Today, we got our park pass to enter Cape Breton Highlands National Park. 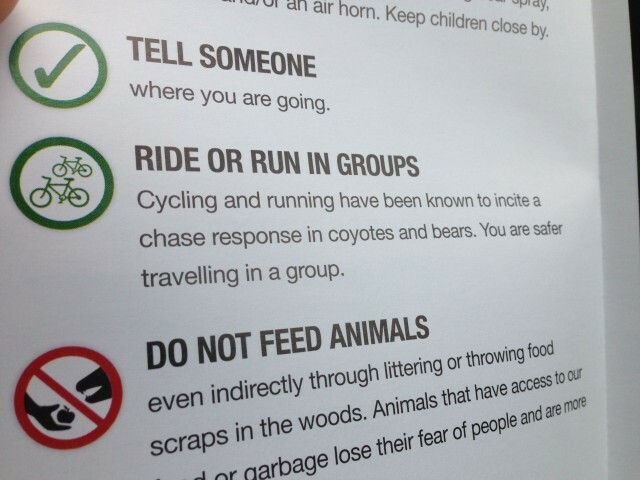 Unsurprisingly, I made sure to peruse the information about wild animal safety. The brochure [PDF linked–highly recommended as general knowledge] helped you understand the difference between defensive and predatory bear attacks. The former, you play dead, and the latter, you fight back to the best of your abilities, make yourself “large,” and engage other offensive maneuvers. (My plan was to stand on Harrison’s shoulders, while pelting any predatory bears with rocks and sticks, while singing showtunes at the top of my lungs. 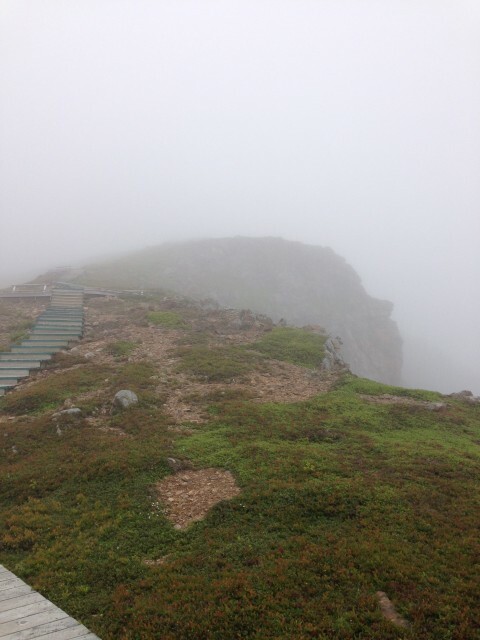 Inside the park, we drove along the Cabot Trail, stopping at scenic overlooks or taking short hikes into the forest or along the coastal cliffs. I am sorry to say that the photos don’t do anything justice; it’s hard to capture natural beauty and wide landscapes on camera. Looking out for extra large waves…. Look at how relevant I am! Even in Canada! After failing to find an open establishment at midday, we stopped for a picnic lunch by the water. Meanwhile, John Cabot‘s bust judged my consumption of large quantities of hummus. As you can see, it was very cloudy today. In fact, we drove through a lot of clouds. Nothing gets the adrenaline pumping like driving or walking with 0% visibility, knowing that you are a few yards away from the edge of a cliff. 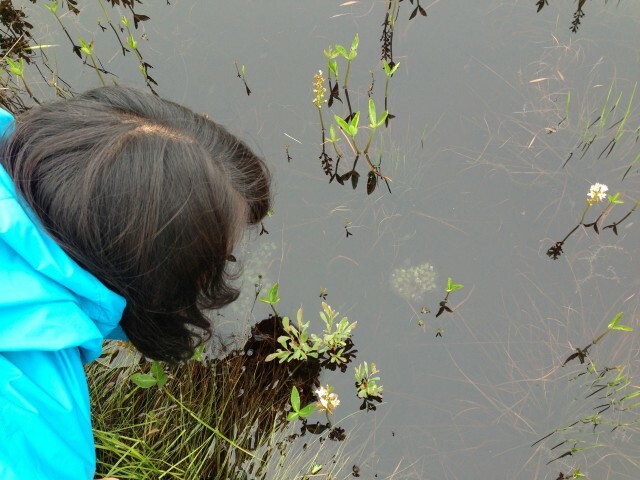 We walked the 5.7-mile Skyline Trail loop in the hopes of seeing moose or whales. 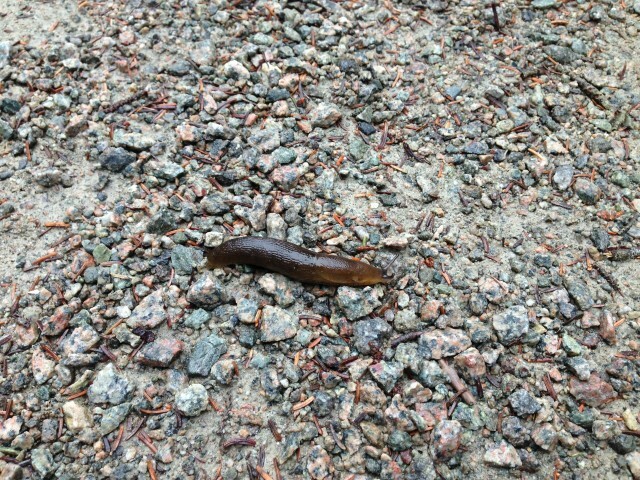 The fog was too dense to see much of anything except for the 2349802384032 slugs on the trail. We did actually see a moose today along the side of the road. We turned a corner…and there he (she? Couldn’t see a beard) was. I tried to get a picture, but it ran away, so you’ll have to believe me. 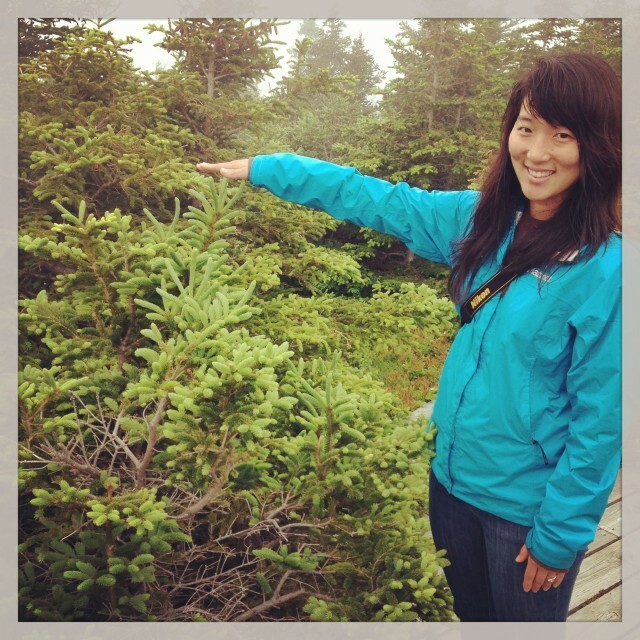 I did get a picture with this pine tree. It did not run away. 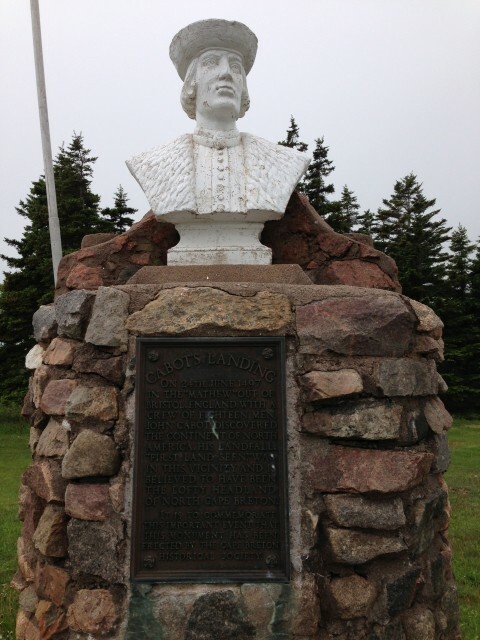 I’m currently writing from the Acadian Motelin Chéticamp, the largest Francophone enclave (linguistic words!) 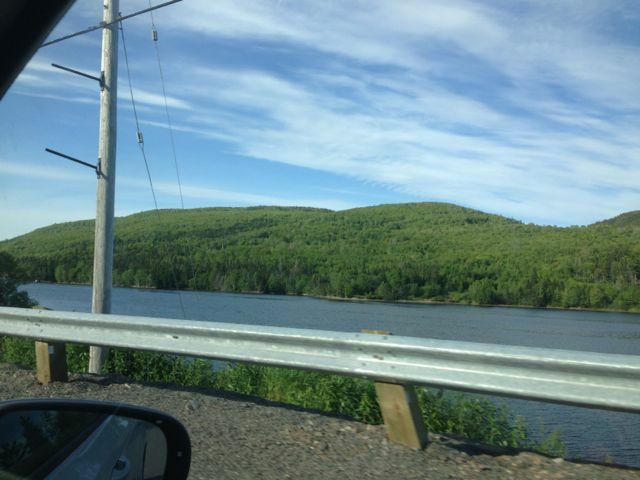 on Cape Breton. Our (also cheap!) room looks out over Chéticamp Harbour. We ate dinner at the Co-op Artisanale, which serves tasty traditional Acadian dishes. 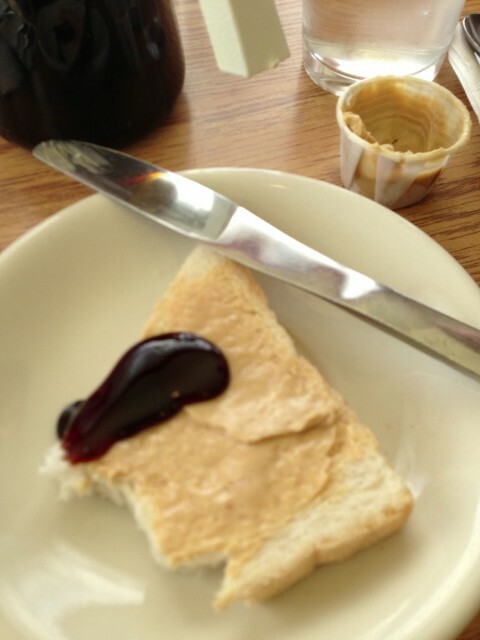 Our meal came with fresh bread, served with butter and molasses. Why didn’t anyone tell me about this combination before? 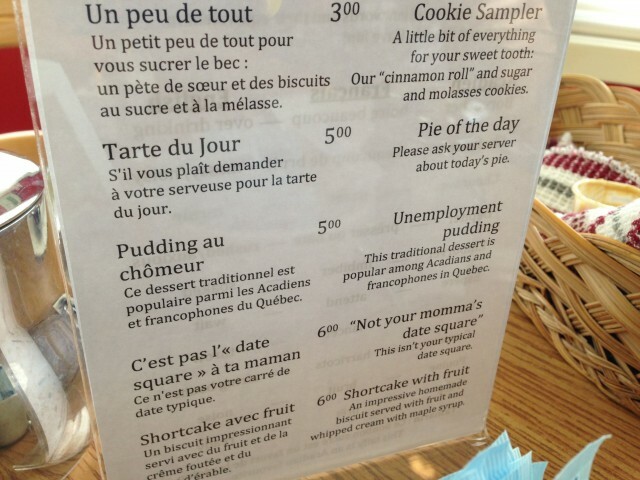 And while I did not order it, I was intrigued by “unemployment pudding” (pudding [au] chômeur). 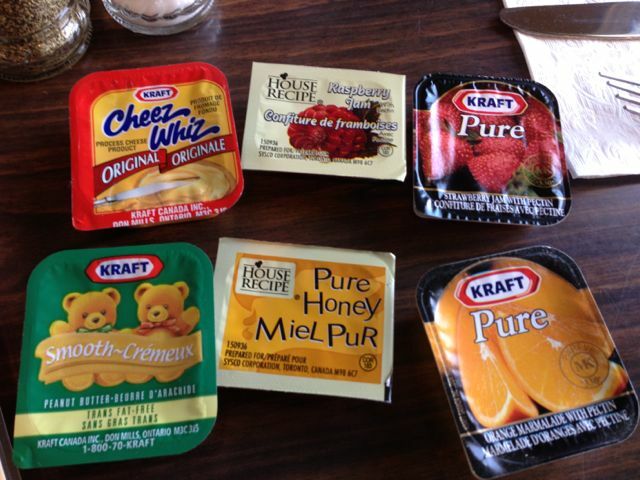 Maybe once I get a job, I’ll eat some unemployment pudding and then laugh in its face…. 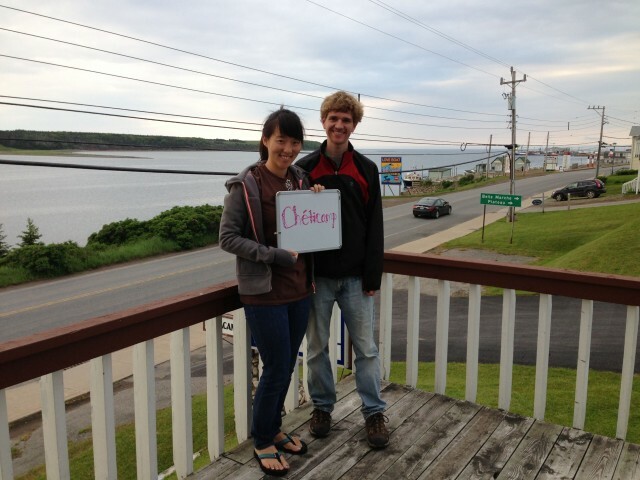 So yes, our séjour in Cape Breton was not what we expected (Well, it wasn’t what Harrison expected. I didn’t have any expectations. ), but it has been awesome nonetheless. I keep saying, “Why don’t more Americans come here?” And the answer is probably (1) they don’t know it exists and (2) it’s freaking far away! We didn’t get to see nearly as much as we wanted, but this is apparently the point of the trip: getting previews of cool places so we know they’re worth returning to. 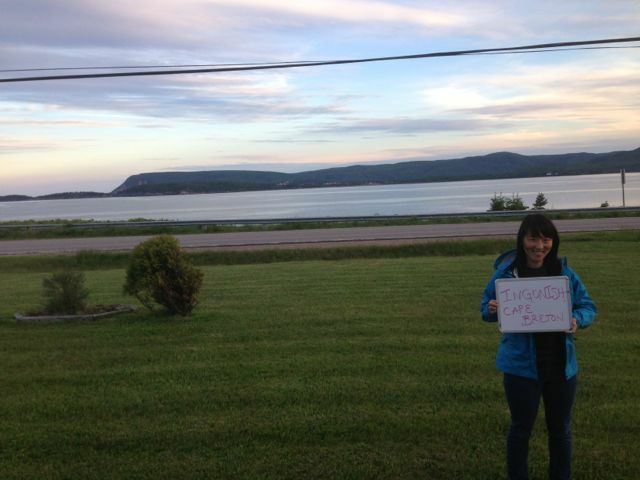 And I definitely encourage you to come check out Cape Breton and the Cabot Trail for yourself. There’s, like, an 85% chance you’ll see a moose!